It's hard to have a page about guns without getting bogged down in an emotional debate on the issues of owning firearms. I'm ambivalent about the subject. I enjoyed the documentary by Michael Moore called Bowling for Columbine and I'm uncomfortable with the stance the NRA takes on many issues. On the other hand I eat meat and I don't have a problem with hunting when it's done humanely for food. I don't believe that responsible gun ownership is bad but I do get impatient when listening to the preposterous arguments from extremists on both sides of the issue. This page just deals with how guns are used on our ranch. A few months ago at 11:30 at night I heard the unmistakable sound of a shotgun blast echoing off the walls of our valley. Just one shot and it got my attention. It turned out that one of our neighbors had literally bumped into a cougar that was hunting on their backyard patio. The gun wasn't fired at the cougar but rather shot into the air to scare it away. That incident is a good illustration of why I own a Winchester 1300-12 gage shotgun. Being so isolated, the only home intruders I'm concerned about are the ones on four feet and the shotgun is just a tool for scaring them away. I also own a Ruger 10/22 rifle and I use it for target practice or, as a last resort, to shoot ground squirrels that evade my Havahart trap and invade the chicken coop. And finally, my handgun is a Smith & Wesson model 686 revolver. It's a 38 caliber pistol that I use for target practice. I originally bought it when I used to go Kayaking by myself up into the lower Grand Canyon. Once again my primary concerned wasn't about personal defense as much as having something to use for signaling for help. The thing is loud and really gets noticed when fired. For practice, I've set up a target range that is ideal for brushing up on my gun handling skills. It's flat and is backed up by a large hill that prevents stray shots from leaving the property. 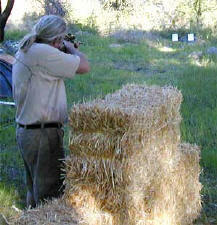 Being able to have a shooting range in your backyard is one of the luxuries of living in the backcountry. Even so, precautions must be taken and you must always think about what might be behind the target. As all gun owners know, depending on the caliber, a stray bullet can travel 2 miles. No mater how isolated we are we take gun storage seriously. All firearms are stored in a locking steel cabinet with ammunition stored separately.